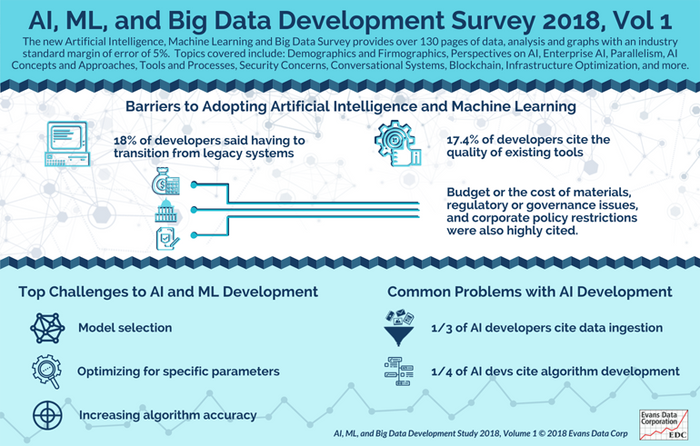 Having to transition from existing legacy systems is the top barrier to incorporation of artificial intelligence or machine learning into organizations today, cited by 18% of developers actively working with AI or ML in Evans Data’s recently released AI, ML and Big Data Development Survey. However, the quality of existing tools was cited by almost the same number (17.4%). 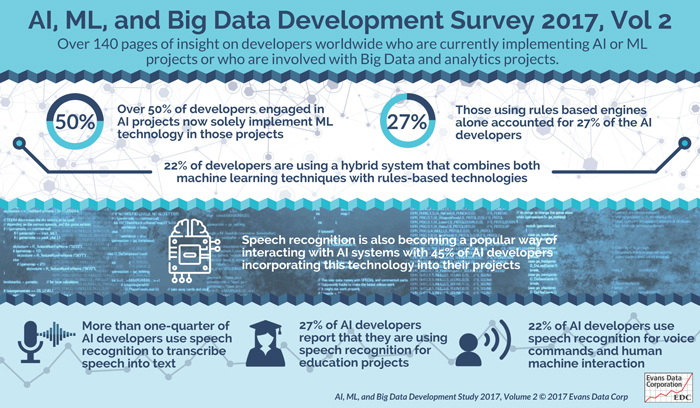 Other factors, such as budget or the cost of materials, regulatory or governance issues, and corporate policy restrictions were also cited by nearly as many AI developers as the top two barriers. The June 2018 survey of active AI developers also showed that model selection is a particularly challenging aspect of AI or ML implementation along with optimizing for specific parameters and increasing algorithm accuracy. Data ingestion is the phase of AI-related development that proves most vexing to fully a third of AI developers while algorithm development is the top problem area for nearly a quarter. Additional insights from the worldwide survey of AI practitioners focus on AI in the large enterprise, hardware, parallelism, algorithms, and other focal areas crafted into data research on questions contributed by some of the largest software companies in the world. The new Artificial Intelligence, Machine Learning and Big Data Survey provides over 130 pages of data, analysis and graphs with an industry standard margin of error of 5%. 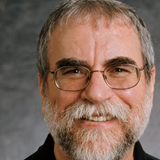 Topics covered include: Demographics and Firmographics, Perspectives on AI, Enterprise AI, Parallelism, AI Concepts and Approaches, Tools and Processes, Security Concerns, Conversational Systems, Blockchain, Infrastructure Optimization, and more. Are the developers in your community using AI and Machine Learning (ML) in their projects? Does your company provide AI and ML technologies and products for developers to use? 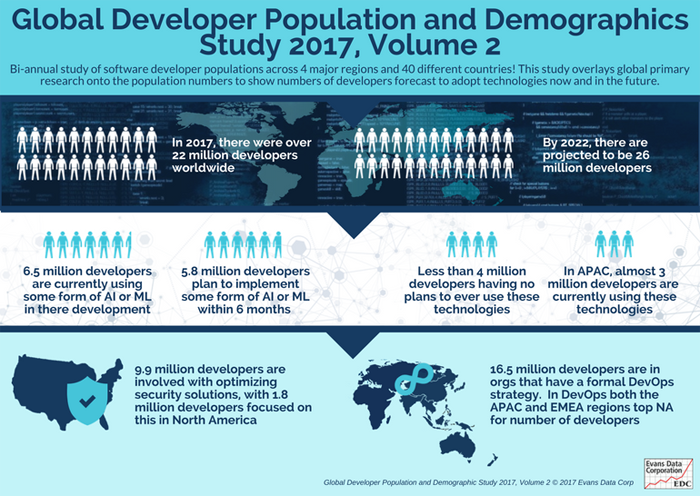 According to recent developer research by Evans Data Corporation, software developers are adopting and using artificial intelligence and machine learning by the millions, according to Evans Data’s newly released Global Development and Demographics Study. Twenty-nine percent of developers worldwide, or 6,452,000 in all, are currently using some form of AI or ML and an additional 5.8 million expect to within the next six months. Others expect to incorporate AI or ML techniques later in the future, with only 18%, or slightly less than 4 million, having no plans to ever use these technologies. The Asia-Pacific region is the strongest with almost 3 million developers currently using these technologies. 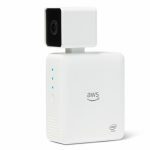 At the AWS re:Invent conference last November, Amazon and Intel announced DeepLens – “The world’s first deep learning enabled video camera for developers.” According to Amazon, “AWS DeepLens helps put deep learning in the hands of developers, literally, with a fully programmable video camera, tutorials, code, and pre-trained models designed to expand deep learning skills.” Developers can pre-order the camera and SDK now for delivery in Spring of this year. In today’s interconnected world, companies in all industries need to publish APIs and cultivate a developer community to access and use them. 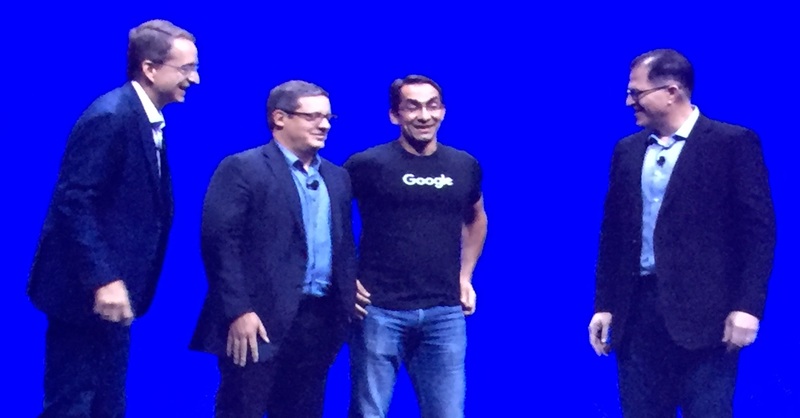 To be competitive today, attracting and supporting developers is essential. The key to cultivating a vibrant developer community that uses your APIs and supports your platform is a good developer relations program. “Developer Programs and APIs in the News” is a series of news items from developer programs around the world. Send me your Developer Programs News! If you have news about your Developer Relations Program, send me an email about the news. Evans Data put out a press release on August 23, 2017 that reported results of a recent cloud development survey. 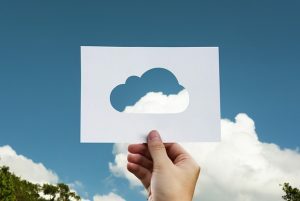 The report showed that almost half of all developers working in and/or deploying to a Cloud are deploying and delivering environmental configurations as instances of immutable architecture (46%) in development testing and production, with only slightly less (42%) doing the same with microservices according to Evans Data Corp’s newly released Cloud Development Survey. In addition to those currently delivering environmental configurations as immutable architectures an additional 37% are experimenting with this technology but haven’t put it into production yet. As for microservices, an additional 34% are evaluating and 15% expect to experiment with microservices in the next year. 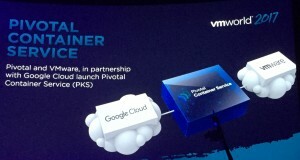 The survey also showed that the most common types of applications that are containerized are Business to Business applications, followed by backend development, and while the vast majority of those who use containers use some kind of orchestration tools, the orchestrator that most use is the one that ships with the container software they use. I attended VMWare’s recent VMWorld 2017 conference in Las Vegas. During the Tuesday morning keynote, Pat Gelsinger (VMware CEO), Michael Dell (Dell Technologies Chairman and CEO), Rob Mee (Pivotal CEO) and Sam Ramji (Google Cloud VP) were on stage to announce that the companies are working together to simplify the creation, deployment, orchestration and management of containers at enterprise scale. 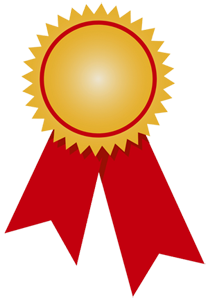 The survey of developers currently developing in or deploying to the Cloud was fielded in June 2017 and provides a margin of error of 4.4%. The full 187 page report includes sections on Cloud Developer Demographics, Migrating to a Cloud, Containers, DevOps and the Cloud, Artificial Intelligence and Machine Learning, Mobile IoT and the Cloud, Security and Governance, and much more!